In case you didn’t know, the F.T.F.O.M.F Tour is coming to Worcester, MA on Saturday, January 26th. You can expect killer performances from Shaggy 2 Dope and Ouija Macc on the main show. After Shaggy performs his last song though, that doesn’t mean the party stops! 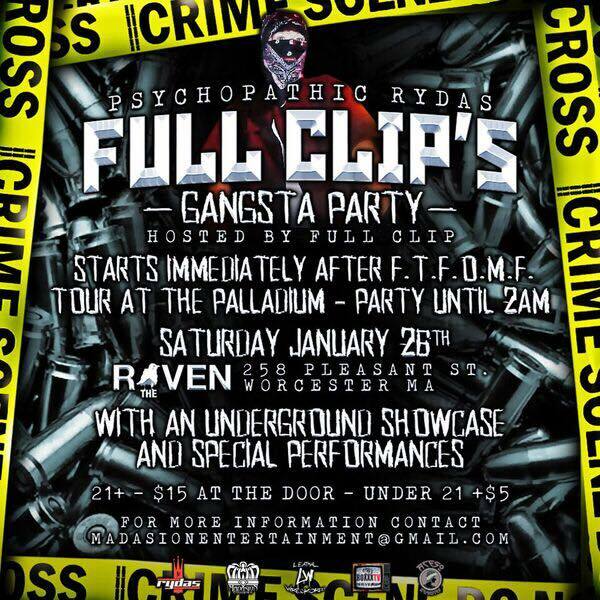 The mysterious Full Clip of the Psychopathic Rydas will host an after party called “Full Clip’s Gangsta Party” immediately after the main show. It’s happening at The Raven, and will feature an underground showcase with special performances!